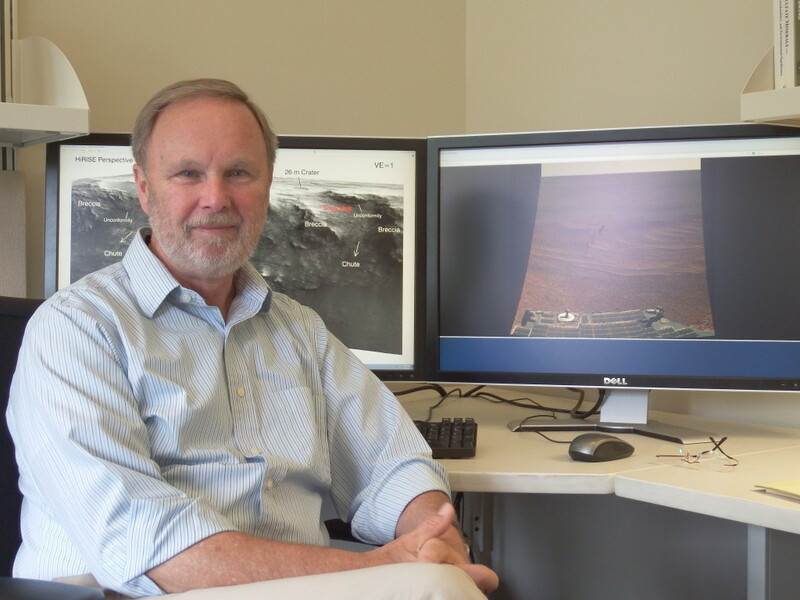 Dr. Ray Arvidson is a James S. McDonnell Distinguished University Professor in the Department of Earth and Planetary Sciences and the Director of the Earth and Planetary Remote Sensing Laboratory at Washington University in St. Louis. He is also the Deputy Principal Investigator for the Mars Exploration Rover Mission as well as a member of the Science team of Curiosity Rover Mission of 2012. He received his Masters and PhD from Brown University and joined the faculty at Washington University afterwards. He has received many awards and honors in his career, including three NASA Public Service Medals, a Washington University Distinguished Faculty Award, Washington University Advisor of the Year Award, the Missouri Governor’s Award for Excellence in Teaching, the Student Union Professor of the Year Award, the Outstanding Graduate Faculty Mentor Award, the Arthur Holly Compton Award for Faculty Achievement, the Whipple Award from the American Geophysical union, and a number of NASA citations and awards from Washington University in Saint Louis. In addition, Ray was recently inducted into Williamstown High School Hall of Fame. He is also a Fellow of the Geological Society of America and the American Geophysical Union. Ray is here with us today to tell us about his journey through life and science. Currently, Ray focuses on teaching and research about current and past environments on the Earth, Mars, and Venus. He is a fellow of the McDonnell Center for the Space Sciences. He has been instrumental in development and implementation of both orbital and landed missions to the planets, including participation in the Magellan Radar Orbiter Mission to Venus, Team Leader for the Viking Lander Imaging System on Mars, member of the Project Science Group for the Mars Global Surveyor Mission, Deputy Principal Investigator for the highly successful Mars Rover Missions (Spirit and Opportunity), the Robotic Arm Co-Investigator (aka “Dig Czar”) for the Mars Phoenix Lander Mission, and Co-Investigator for the hyperspectral mappers OMEGA (European Mars Express Orbiter) and CRISM (on the Mars Reconnaissance Orbiter). Currently he is a participating scientist on the Mars Science Laboratory Mission. He is the Director of the NASA Planetary Data System Geosciences Node, making available ~100 terabytes of NASA data to the world-wide research community. He is also Director of the undergraduate Pathfinder Program in Environmental Sustainability (http://wufs.wustl.edu/pathfinder).